(2) Kansas State Wildcats Led by two uppperclassmen guards, a key for K-State, the Wildcats are dangerous. Junior guard Jacob Pullen comes to play in big spots. Against Baylor in the Big 12 tourney, Pullen scored 26 points including five three-pointers and got to the free throw line to shoot ten free throws. Senior guard Denis Clemente is of the same caliber. Averaging 16 points per game on the season, Clemente shows up in big spots as well, 23 points in a road win in Lincoln, 30 at Iowa State, and 27 in Norman against the Sooners, all road wins for the Wildcats. Can this team beat a Big East team? If they play Pittsburgh before 'Cuse, you bet. 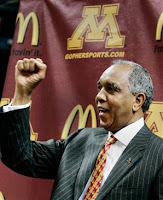 (11) Minnesota Golden Gophers Tubby Smith's team had to play tough to get into the tourney, but play tough they did. Sitting at 18-12 heading into their end of the season conference tournament, things weren't looking good for Coach Smith. Till his boys came to play and ripped off three straight wins including two against ranked Michigan State and ranked Purdue. Yes, they were dispatched by nearly thirty-points against Ohio State, but they have a quality coach in the big dance, and that matters. The conference tourney wasn't the only time Minnesota played well, they lost alot of close hard faught games, a 1-point loss at Purdue when Robbie Hummel was playing, a 3-point loss at Indiana, a 9-point loss against Ohio State, but this team is quality. Sophomore guard Devoe Joseph will have to be up for the task of playing in tight spots if they're going to get anywhere. Averaging nearly 15 points a game in the Big Ten tournament got them there, if they want to continue, they'll need more of the same from the Ontario bor guard. (12) UTEP Miners Yes I said it. Now that everyone has gone ahead and jumped on board, here's why. The Miners have played against good opponents this year and done well. They jumped all over Memphis and played both BYU and Texas Tech tough. I understand that Butler is a tournament tested team and for them to win that first round game would shock a few people, but they are capable. With just three underclassmen, the Miners are loaded with veteran players who been playing together for a while. Junior guard Randy Culpepper, who has a game this season which he went off for 39 points including nine three-pointers! Smell tournament upset yet? Big man Derrick Caracter, the junior forward 6'9" forward who has had at least eight games in the last two months where he pulled down at least eight rebounds, including three where he went over 12 boards a game. The Miners have Sweet 16 upset bid writte all over them. (3) Pittsburgh Panthers In mid-February this pick looked much better. Pitt had won five straight games including two huge victories against a 4th ranked West Virginia squad and 3rd ranked Villanova team, don't forget they caught a Marquette team in their own building as well. However, since February 24th they themselves got caught into the Notre Dame game, slow it down and play halfcourt and the Panthers showed their weaknesses. So why is Pitt on a short list of teams that can knock off the top seeded Orange? Because they already have once this season. On January 2nd, the Panthers went up to the Carrier Dome and handed the Orange a ten point loss on their turf. Guards Ashton Gibbs and Jermaine Dixon went for a combined 45-points that night and cruised to a late game victory. In their victory against West Virgina it was Gibbs and Brad Wanamaker who stepped up scoring a combined 48-points. Think Pitt has what it takes now? Head coach Jamie Dixon has big time Tourney experience after their elite eight run a season ago, if they want to take it one step further, it'll have to go through 'Cuse to do it. The West Region isn't as up for grabs as some would lead you to believe. While the Orange may have to open without Arinze Onuaku, they've got other players all over the floor. Including junior forward Wes Johnson, who may be heading into his final showcase for NBA scouts everywhere. Including Andy Rautins, the senior guard who has at times shown his ability to go off, in back to back road wins against Georgetown and Providence, Rautins went for 26 and 28 respectively. The 'Cuse are in charge of this West Region, but they'll need some big time players to return to where they were just weeks ago.